A Wal-Mart slated to be built at the corner of Wurzback Parkway and Blanco Road has angered nearby North Castle Hill residents. 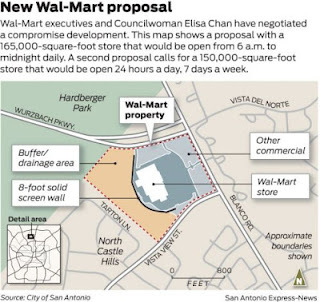 On Tuesday, their councilwoman, Eliza Chan, presented area residents with the results of her negotiations with Wal-Mart representatives. Many were still not happy, My San Antonio.com reports. Chan presented two proposals for her constituents to consider: one is for a 165,000 square-foot store that would be open between 6am and midnight. The other other is for a 150,000 square-foot store that is open 24 hours. Both proposals include concessions such as a banning of a gas station or tire and battery center, a minimum of 300 feet between the nearby North Castle Hills neighborhood and Hardberger Park, and an 8 foot wall between the store and the buffer area, which would be rezoned as a green space that cannot be developed. In addition, there will only be five pad sites along the road, down from the original seven, and there will be fewer curb cuts to enter the property. Also, deed restrictions would prohibit several uses, such as gas stations, adult bookstores, and bars. 18-wheelers would be banned from Vista View, which is the street into the neighborhood, and from making deliveries after midnight, although it’s unknown how early they could begin making deliveries. Despite many in the audience’s unhappiness with Chan’s efforts, she pointed out that she inherited this problem and revealed Wal-mart’s original plan, which included a 180,000 square-foot store and a large apartment complex between the store and the neighborhood and park. Chan warned that if the neighborhood doesn’t agree to one of the two proposals, they could wind up with the apartments in addition to the store, as well as no protection zone. Under both of the current plans, apartments would no longer be an option.